Playing high definition content on current generation PCs can bog down even the fastest processors because there is more data to handle. AMD's AVIVO is a collection of different video technologies that share a common name, like Centrino or ViiV for example. First and foremost, AMD's AVIVO includes a hardware accelerator for MPEG-2/DVD Microsoft Windows Media HD video standards (WMV HD) and H.264 standards. AVIVO is built into the Gigabyte GA-MA69G-S3H's Radeon Xpress 1250 videocard and helps to enable such features as Home Theatre PCs (HTPC) or Personal Video Recorders (PVR) with the appropriate 3rd-party software applications. AVIVO can automatically adjust gamma and colour correction, and that should enhance picture quality too. High Fidelity Colour allows for 10-bits per colour channel, which translated basically means a more vibrant picture. There is also a high quality 12-bit analog-to-digital converter to reduce picture noise as well. To test AVIVO's HD accelerating capabilities, we played the High Definition Blu-Ray movie The League of Extraordinary Gentlemen through CyberLink PowerDVD 7.2 Ultra. CPU utilization was monitored during playback through Task Manager to give a general indication of system load. CPU usage jumps around when running the Blu-Ray movie "The League of Extraordinary Gentlemen" but maintains an average of 60% CPU usage. It's high but enough for the background tasks to do its job. Mainstream videocard worthy competitor to Geforce 8600? Right now is a good time if you've been waiting to upgrade your videocard. DirectX 10 games are being released every month, and if one of those new titles catches your attention you'll need to have the right PC hardware and Microsoft Windows Vista to play it. As you've seen in this review, on paper at least the AMD Radeon HD 2600XT should be a rock solid videocard. However, as the benchmarks have shown us, it doesn't always fair as well as the popular nVidia GeForce 8600GTS. 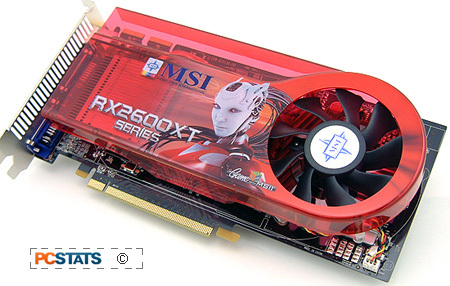 The RX2600XT Diamond is MSI's AMD challenger in the mainstream videocard market. With a retail price $136 CDN ($140 US, £68 GBP) it will definitely garner some attention. The videocard comes with everything you'd need to connect the videocard to the television including a DVI to HDMI converter (with audio over HDMI). Games were not included with the videocard. The MSI RX2600XT Diamond doesn't generate a lot of heat and is very quiet. MSI has always been good at keeping its videocards quiet and the RX2600XT Diamond is no exception. In terms of performance, the benchmarks have shown us that MSI's RX2600XT Diamond is a little slower than the average nVIDIA GeForce 8600GTS. It looks like the AMD Radeon HD 2600XT VPU might be in the same class as the GeForce 8600GT. Of course the AMD VPU is still pretty fresh, and as the product line matures, AMD may extract more performance from the core. The MSI RX2600XT Diamond will play most current games without much difficulty at moderate resolutions, and moderate detail settings. However, high resolution gaming with all the eye candy turned on is definitely out of the question. Overclocking this pre-overclocked MSI RX2600XT Diamond videocard was a bust for us. MSI ship the videocard with its GPU set to 850MHz (up from the default of 800MHz) and 512MB of GDDR4 memory running at 2300MHz (up from the default of 2200MHz), so you'll have to be satisfied with that. MSI videocards are usually pretty good at overclocking, but PCSTATS could not push the Radeon 2600XT GPU or memory speed any further. To be fair to MSI, this seems to be a problem with the Radeon HD 2600XT. Speculating, the core and memory temperatures were quite low so perhaps the videocard needs more power than the PCI Express x16 slot can provide. What's the bottom line you ask? Well, the MSI RX2600XT Diamond is a excellent multimedia videocard, and if you're looking for something of general purpose, you will not be disappointed. It outputs s-Video or Composite component and HDMI with audio! Few other videocards have offered HDMI signal streams from the DVI port with audio, so from a HTPC perspective the MSI RX2600XT Diamond is fully featured. On the other side of the coin, if you're strictly a gamer, and in particular looking toward DirectX10 game titles, there are other videocard GPUs which provide better framerates for comparable pricing.